WARNINGS. IF YOU ARE PREGNANT OR BREAST-FEEDING, ONLY USE THIS MEDICINE ON THE ADVICE OF YOUR HEALTH CARE PROVIDER. Smoking can seriously harm your child. Try to stop smoking without using any nicotine replacement medicine. This medicine is believed to be safer than smoking. However, the risk to your child from medicine are not fully known. ASK A DOCTOR BEFORE USE IF YOU HAVE. • a sodium-restricted diet. • heart disease, recent heart attack, or irregular heartbeat. Nicotine can increase your heart rate. • high blood pressure not controlled with medication. Nicotine can increase blood pressure. • stomach ulcer or diabetes. • history of seizures. ASK A DOCTOR OR PHARMACIST BEFORE USE IF YOU ARE. • using a non-nicotine stop smoking drug. • taking prescription medicine for depression or asthma. Your prescription dose may need to be adjusted. KEEP OUT OF REACH OF CHILDREN AND PETS. Pieces of nicotine gum may have enough nicotine to make children and pets sick. Wrap used pieces of gum in paper and throw away in the trash. In case of overdose, get medical help or contact a Poison Control Center right away. ■ NOT FOR SALE TO THOSE UNDER 18 YEARS OF AGE. ■ PROOF OF AGE REQUIRED. ■ NOT FOR SALE IN VENDING MACHINES OR FROM ANY SOURCE WHERE PROOF OF AGE CANNOT BE VERIFIED. This product is protected in sealed blisters. DO NOT USE IF INDIVIDUAL BLISTERS OR PRINTED BACKINGS ARE BROKEN, OPEN, OR TORN. Inactive Ingredients: D And c yellow #10, flavors, glycerin, gum base, sodium carbonate, sorbitol. ;D&c yellow #10, flavors, glycerin, gum base, sodium carbonate, sorbitol. Ingredients: Active Ingredients: Nicotine Polacrilex (Equal to 4 mg Nicotine). Purpose: Stop smoking aid. Inactive Ingredients: D&C Yellow 10, Flavors, Glycerin, Gum Base, Sodium Carbonate, Sorbitol. Instructions: If you are under 18 years Of age, ask a doctor before use. Before using this product, read the enclosed user's guide for complete directions And other important information. Stop smoking completely when you begin using the gum. If you smoke less than 25 cigarettes a day, use 2mg nicotine gum. If you smoke 25 or more cigarettes a day, use according To the following 12 week schedule: weeks 1 To 6--1 piece every 1 To 2 hours. Weeks 7 To 9--1 piece every 2 To 4 hours. Weeks 10 To 12--1 piece every 4 To 8 hours. 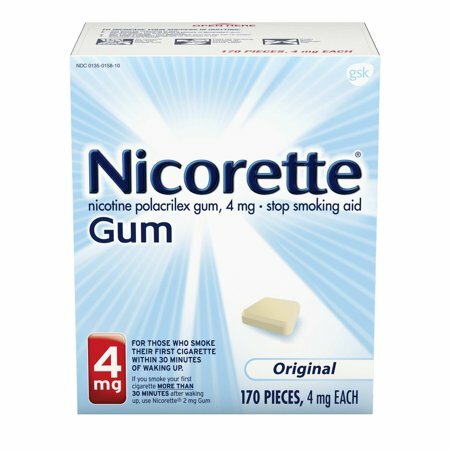 Nicotine gum is a medicine And must be used a certain way To get the best results. Chew the gum slowly until it tingles. Then park it between your cheek And gum. When the tingle is gone, begin chewing again, until the tingle returns. Repeat this process until most Of the tingle is gone (about 30 minutes). Do not eat or drink for 15 minutes before chewing the nicotine gum, or while chewing a piece. To improve your chances Of quitting, use at least 9 pieces per day for the first 6 weeks. If you experience strong or frequent cravings, you may use a second piece within the hour. However, do not continuously use one piece after another since this may cause you hiccups, heartburn, nausea or other side effects. Do not use more than 24 pieces a day. It is important To complete treatment. Stop using the nicotine gum at the end Of 12 weeks. 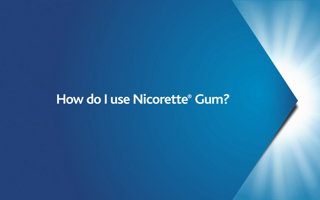 If you still feel the need To use nicotine gum, talk To your doctor. Store at 20-25 c (68-77 f). Protect From light. My husband has benefited greatly from this product. It isn't the tastiest thing ever, especially the spit you swallow when disolve the top layer. However, I was smoking like 4-7 blakc and milds a day and now its like one or two max. I just chew a piece when the craving hits and most of the times it goes away and I avoid it to the next necessity. I will say though that I definitely felt a heavy withdrawal phase. This stuff really works to help quit smoking if you even remotely want to quit! It worked for me last time i quit!